During a regular National Women’s Soccer League (NWSL) season, one team plays 24 guaranteed matches over the course of almost nine months. With one to two matches and approximately one day off per week, how much quality fitness training is truly meeting the physical threshold required of a professional soccer player? It can be very difficult to keep each player’s training load equivalent while accounting for playing time, travel, injury, fatigue, mid-season transfers, and in some cases, players leaving for national team duties. Categorizing players according to the volume and the type of training stimulus they are receiving is beneficial for keeping players on the same page, preventing player fall-off. This can be achieved through dense post-game conditioning. Obviously, different physiological attributes decay at different rates. Considering the length and demands of an NWSL season, it is likely a team may have two or more consecutive days off. Within one to three days of no training (or a player sitting on the bench getting zero minutes), aerobic abilities can start to diminish, followed shortly by anaerobic lactic capacity. Strength gains may hold on for a little longer (approximately four to six weeks), however, strength is less likely to be addressed as the season continues. While aerobic abilities are typically tackled in practices and games, it is improbable players will perform at maximum velocities meeting and surpassing the physical anaerobic threshold outside of specific conditioning according to GPS/HR data collected (Mike Young, 2014). The bottom line is if players aren’t training to maximal effort at least once a week, fitness levels will decrease, fatigue will creep in, and performance will suffer, especially for those lacking 90 minutes of game time. Who runs the most on the pitch, and are they the most fit player? All members of a team do not contribute the same volume of quantifiable work throughout the season, especially if we’re comparing playing time. Let’s say seven or eight players play a full 90 minutes, three or four get in 20-60 minutes, and another four or five dress-out but don’t play, not to mention those injured or not officially on the roster. They have all tapered two to three days prior to the match and trained all week in practice, but some are now receiving a stimulus that others are not. Even if those that didn’t see the field during a game perform extra conditioning the next day in practice the recovery and timing of the stimulus received will be slightly off from the players receiving full 90 minutes of playing time. They may experience soreness or fatigue at a time when 90 minute players are going all out, with full effort. This could potentially be problematic when considering fatigue-related injury, overall quality of practice, or fluctuating minutes spent in various games. Research has shown players at the most elite level are likely to cover 10-13 kilometers per match through mostly aerobic means such as walking and low-intensity running. High-intensity running is seen less, however, sprint speeds have been recorded above 30km/hr for longer than 30 meters (Bangsbo, Mohr, Krustrup, 2006). Think of these players as the one categorized earlier for receiving 60+ minutes of game time. Now the other ten or more on the team playing less time or none at all are lacking a specific stimulus. By potentially densifying conditioning for 20-30 minutes after a match, players contributing less than that of full-match players can maintain similar, if not the same fitness levels. 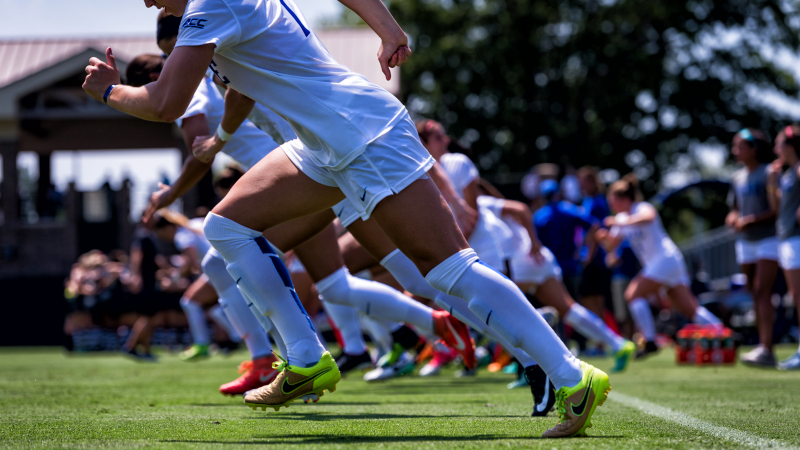 Conditioning after a game based on the number of minutes played is a strategy preferred and recommended by arguably the most fit team in the NWSL. As the saying goes, “fair isn’t equal and equal isn’t fair.” A recommended regimen for those playing less than 15 minutes per game could be eight 40 meter sprints at 95% effort on a 40 second interval. This can be followed by two sets of eight runs from the center line to the 18 and back at 75% intensity for 15 seconds of work with 15 seconds of rest. Following similar guidelines, those playing 16-30 minutes could benefit from a set of six 40 meter sprints at 95% of their maximal effort on a 40 second interval, followed by one set of 8 runs at 75% for 15 seconds of work and 15 seconds of rest. By looking at variables such as game load, strength training load overtime, and subjective qualities the players can be individually monitored to a point of receiving an appropriate amount of overload while managing fatigue to allow for adaptations. Completing densified moderate to higher-intensity conditioning after not playing a full 90 minutes can provide similar fitness benefits and results to participating in a full match without interfering with regular practice. While managing a team can be more difficult than a single athlete, it is important to oversee each player especially as the season gets more complex to ensure optimal health and peak fitness performances. Bangsbo, J., Mohr, M., Krustup, P. (2006). Physical and Metabolic Demands of Training and Match-Play in the Elite Football Player. Journal of Sports Sciences, 24(7), 665-674. Hey great post, I’m curious about the protocol for the players who had only played <15 minutes. Is the first exercise 8 x 40 m sprint with 2 minutes between each sprint? I was confused by the “at the 40 second interval” part. That was actually a typo, sorry about that! It should read, “8x40m sprints at 95% effort on a 40 second interval.” You will want to rest a 2-3 minutes before moving into the 15 seconds on/15 seconds off conditioning exercise described next. Is the intensity based on mean aerobic speed or perceived intensity? For this type of conditioning I would definitely recommend basing off perceived intensity. 95% effort should feel like all-out sprinting, while 75% effort should be more conservatively paced to meet the 15 seconds of work prescription, but still somewhat challenging. Athletes will become increasingly familiar with this “perceived intensity” method, learning how the sprint speed should be performed.